Trick or Treat. : Popular halloween game - bobbing for appes. Popular halloween game - bobbing for appes. The oldest and most well known Halloween party game is Bobbing for Apples, originally known as Ducking for Apples. The game, which originated in the British Isles, dates back to at least three hundred years and originally had something to do with fortune telling as noted by British author W.H. Davenport Adams. Fill a large tub or basin full of water. Place apples into the water, they will float. 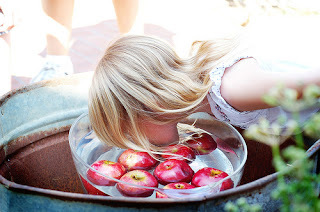 Have party guests try to catch and remove apples from the water by grabbing them with their teeth. Players will usually get wet when playing this game, so have some towels available for guests to dry off with. This old fashioned party game is played by hanging sticky treats from the ceiling on long strings, and having players eat the treats without using their hands. In the past, treacle or syrup-coated scones were used, as well as apples covered in toffee. The updated version of this game can feature any kind of treat. Glazed donuts are a popular modern day choice for this game, as they are easy to tie on to a string and are very sticky. Any type of treat that can be tied to a string will work, the fun part is getting as sticky as possible. Tie long strings around sticky treats. Hang the strings from the ceiling, so that the treats hang down to a length in which players will be able to eat them with their mouths. Have players stand underneath the treat of their choice, and eat it without using their hands. This traditional Halloween game is a popular one for parties. Players take rolls of white crepe paper or toilet paper, and wrap their teammate like a mummy from head to toe. The object of this game is to see who can wrap the mummy the fastest. Divide party guests into teams of two or three. Say to the teams, "Ready, set, go!" Have the teams race to wrap the mummy in the paper from head to toe. The first team to wrap their mummy completely wins. Where does the word “Halloween” come from?